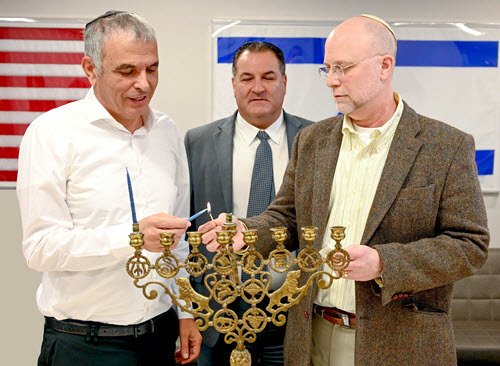 On December 3, Israel Bonds was privileged to welcome Israeli Finance Minister Moshe Kahlon, who joined Bonds staff in celebrating Hanukkah at the organization’s corporate headquarters in midtown Manhattan. Israel Bonds Synagogue and Rabbinic Division (Photo: Shahar Azran)In noting that this was his third visit to Bonds headquarters this year, the finance minister said, “This is very important for me. I appreciate your hard work. Israel Bonds is the connection between Israel and Jews around the world, most especially the young generation.”Joining the finance minister were ministry Director General Shai Babad and spokesperson Omri Sheinfeld. During the ceremony, Israel Bonds Chairman of the Board Howard L. Goldstein spoke of the organization’s accomplishment of exceeding $1 billion in annual U.S. sales at the earliest point ever, thanking staff at every level for “one of the most successful years in the organization’s history.” This was the sixth consecutive year U.S. Israel bond sales surpassed $1 billion.